FDA's recent "untitled" letters notifying 14 pharmaceutical companies that their search engine paid search ads violate FDA regulations (see "The 14 Letters. Who at the FDA Knew What and When?") has opened a can of worms that is rapidly becoming a snake pit for pharmaceutical marketers. FDA's actions and the resultant analysis by bloggers, ad agencies, and consultants has opened several questions about the current search engine marketing practices of pharmaceutical companies. On example concerns the use of "vanity" or "redirect" URLs in Google adwords (paid ads). According to Wikipedia "URL redirection, also called URL forwarding, domain redirection and domain forwarding, is a technique on the World Wide Web for making a web page available under many URLs." There are good and legitimate reasons for using redirection, but when used in a paid search ad for an Rx product, redirection is always used to mask the fact that you will be going to a branded Rx site. As Robert Kadar of GoodHealthAdvertising.com says in a comment to my previous post, "your example does seem to violate Google rules but they obviously have made an exception for Pharma as a large percentage of pharma brands are masking the url's of their brand sites with generic names like depressionhurts.com [which takes you to www.cymbalta.com]. I believe that at the minimum this is a bad user experience and at worst is false advertising." Usually, as I pointed out in yesterday's post, Google does not allow redirect URLs in adwords. Google's public policy states: "Your display URL must accurately reflect the URL of the website you're advertising. It should match the domain of your landing page so that users will know which site they'll be taken to when they click on your ad." It appears, however, that Google has carved out an exception to this policy to allow pharmaceutical marketers to create adwords that mention the drug's benefits WITHOUT having to include the drug name as would be the case if the URL accurately reflected where the consumer would be sent if he or she clicked on the ad. Consumer might be "fooled" into thinking they were going to an independent site and NOT to a pharmaceutical company site. Would they be harmed? Probably not. But another commenter to my post, enkil76, pointed out that this practice may be another sort of "one-click rule" destined to cause trouble for pharma: "Is this like the one-click rule? At this point, I would say [FDA] haven't been enforcing a rule. What says tomorrow they won't?" Once again the FDA is going into areas in which it has no expertise or knowledge. I am sure that consumers don't care about the actual URL as they click on something to get information not because of the website. For example, if a consumers was interested in the signs and symptoms of depression and the URL was signsofdepression.com and the page was on Cymbalta.com with the information they will still be getting the information. I also believe that the drug companies need to clearly differentiate the promotional and educational information. I am sure that there can be some debate on this question. The problem is, we DO NOT know what the FDA's thinking is and WON'T know until (1) FDA issues more letters, or (2) FDA issues guidance (hopefully only AFTER having a public hearing). Which course do you favor? You got bigger fish to fry. I mean come on, this is so insignificant. You should be focusing on a much larger picture than redirected URLs...no? Come on champ -- you can do it!! Couldent the redirect land consumers immediately on a benefits/risks page, either specially developed or within the branded site anyway - ie one click away ruling? If I were a pharmaceutical marketer or someone giving advice to pharma marketers, I would be a bit gun-shy because FDA's "guidance by warning/untitled letter" approach has raised many questions about what will pas FDA muster in the future. Then there's the HIGHER AUTHORITY -- Google! Has Google indeed "officially" carved out an exception to its prohibition of redirect URLs in adwords or hasn't it? Rumors are flying! Then there's the poor consumer caught in the middle. Everyone claims to be speaking for the typical online consumer, but I haven't seen any consumer advocates weigh in on this issue. Perhaps it's too technical or too unimportant. If so, why does Google have a rule about redirect URLs in the first place? It must have thought it was fraudulent or shady or not best practice. Why, all of a sudden, would it allow pharma to do something less than honest? Don't answer that. I already know the answer! The "one click away" rule has simply been an industry assumption used in the past. The FDA has simply not commented for years, allowing ads with brand and indication information to occur, and then slamming 14 companies, whilst ignoring others that were using similar promotional materials, in terma of brand names and indication information. The display or vanity URL provides a process whereby a consumer never sees the brand name until they are on the site where the PI is also present, so the "one click away" is not an issue. Brand name and risk information is all on the same page. In fact, from measurement consumers seem to find that if the copy is compelling and relevant to their search, it has value to them. Also, if you examine the full range of products provided by the companies that received the warning letters, some of those companies have other products that either had branded ads, with adjacent established name, with no indication information (the official site...) or there are products which were using vainty URLs and those products were NOT cited. 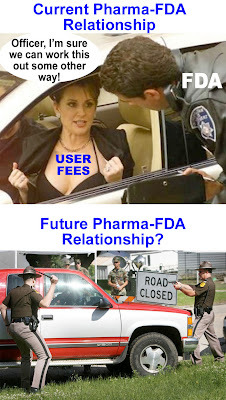 The FDA has definitely dropped the ball on setting clear rules/regulations for the Pharma companies. I talked to some physicians about what they think of the FDA and their guidelines on pharma advertising. They said that the stringent guidelines the FDA has imposed on drug advertising has caused a decrease in compliance of certain medications, mainly psychiatric. When someone suffering from an eating disorder reads that the anti-depressent they were prescribed may cause weight gain, or someone with bi-polar hears that their mood stabilizer might cause sudden death the drug goes in the trash. They would prefer that the FDA not have such stringent policies concerning advertising and allow the physicians to explain the risks/benefits in a way that doesn't cause the patient to refuse treatment.